den Juni 25, 2017, 12:47 p.m.
Twenty years ago today - 26 June 1997 - the first book by a struggling author about the magical tribulations of an orphaned schoolboy was published. Despite the faith that JK Rowling had in young Harry, it is unlikely she or anyone else could have anticipated that the the book, its sequels and their films would spawn a $25 billion dollar franchise. In honour of this milestone for the boy wizard, YouGov has conducted a special Harry Potter survey. When asked to choose which of a selection of personality traits they felt most applied to them, 54% of all Britons chose “hard work, patience, justice and loyalty” – the hallmarks of a Hufflepuff. Hopefully this news will give heart to JK Rowling’s daughter Jessica, who the author has quoted as saying “we should all want to be Hufflepuffs”. Just over a third of Brits (36%) are Ravenclaws, identifying with “intelligence, creativity, learning and wit”. Only a tiny proportion of Brits identified the most closely with the values of Gryffindor (“courage, bravery, nerve and chivalry” on 4%) or Slytherin (“ambition, cunning, leadership and resourcefulness” on 5%). However, Hufflepuff does have something of a reputation in the Potterhead community for being kind of… lame. This is reflected by the fact that, when we asked Harry Potter fans what Hogwarts House they would want to be sorted into, just 16% said Hufflepuff, putting it in third position, ahead of only Slytherin (8%). It seems that the Harry Potter books have served as a recruitment campaign for Gryffindor, with 57% of Potterheads saying they would want to be in the same House as Harry, Ron and Hermione. 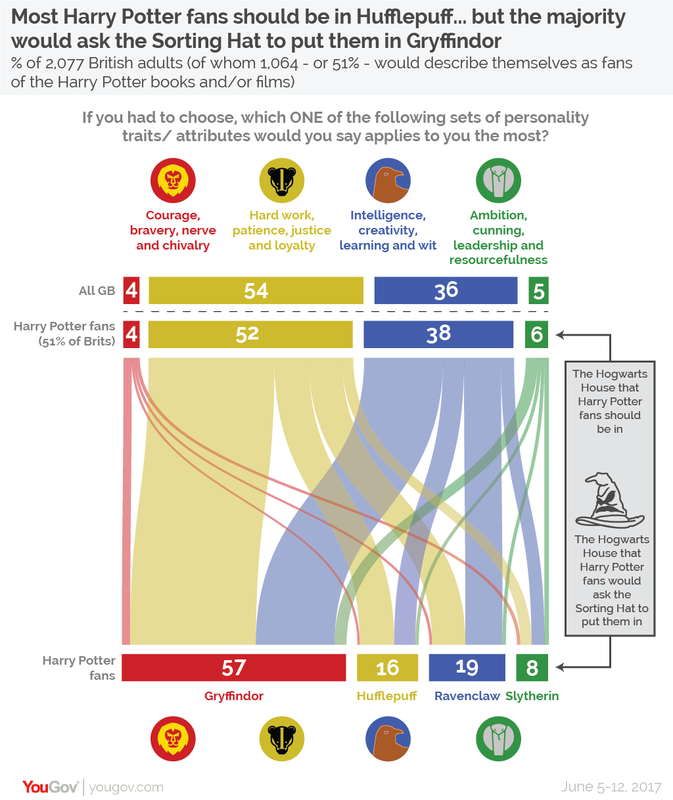 On top of asking Potterheads what Hogwarts House they thought they should be in, YouGov also asked them to act as a human Sorting Hat to a selection of celebrities and public figures. Their time in Gryffindor on-screen has clearly left an impression on Harry Potter fans, as Daniel Radcliffe and Emma Watson are seen as Britain’s biggest Gryffindors, at 59% and 53% respectively. JK Rowling herself is the third person most likely to be inhabiting Gryffindor Tower, at 37%: the Harry Potter author has previously revealed that the Pottermore website sorted her into Gryffindor. 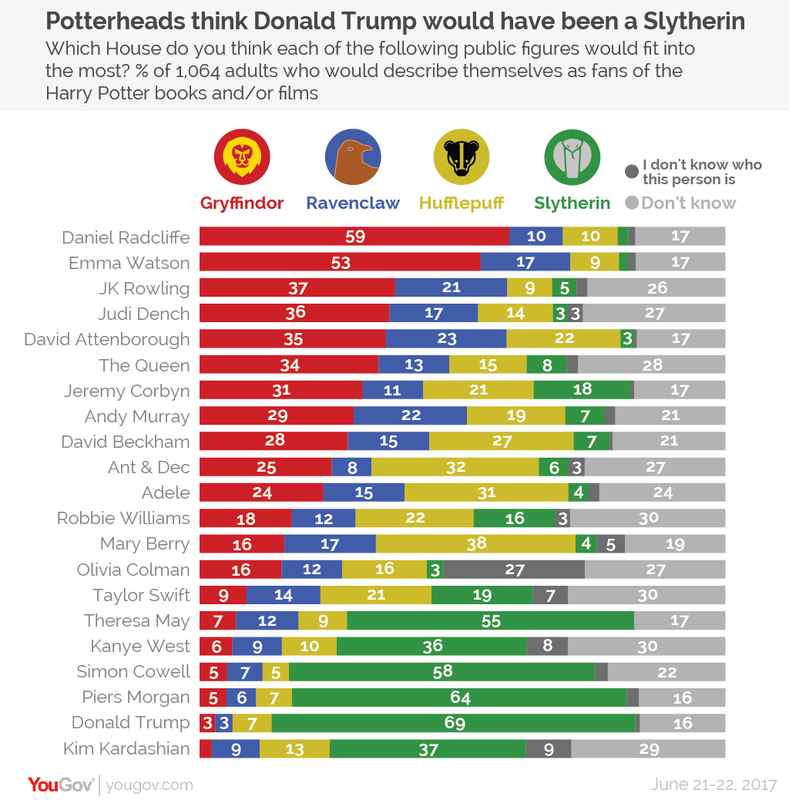 Moving away from Gryffindor Tower, the public figure seen by Harry Potter fans as most likely to be a Slytherin is Donald Trump. Almost seven in ten (69%) put the US president in Hogwarts’ most mistrusted House. Piers Morgan is the second most likely Slytherin, on 64%, which may be unsurprising given his declared dislike of Harry Potter and his attempts to engage JK Rowling in Twitter spats. Cake-maker extraordinaire Mary Berry is seen as Britain’s most likely Hufflepuff, at 38%. She is followed by Ant and Dec (we’ve kept them as one unit, Fred and George Weasley-style) at 32%, and Adele at 31%. Ravenclaw was the House that Potterheads were least likely to assign any of our celebrities to. National treasure David Attenborough was seen as the most likely to be a Ravenclaw, at 23%, followed by Andy Murray (22%) and JK Rowling (21%). However, all three of these celebrities were seen as more likely to be Gryffindors. Perhaps surprisingly, given the series is named after him, Harry Potter is only Potterheads’ third favourite character. When asked to choose their three favourite Harry Potter roles, Potter himself was only chosen by 25% of fans. Hermione Granger edges Harry out with 27% support. 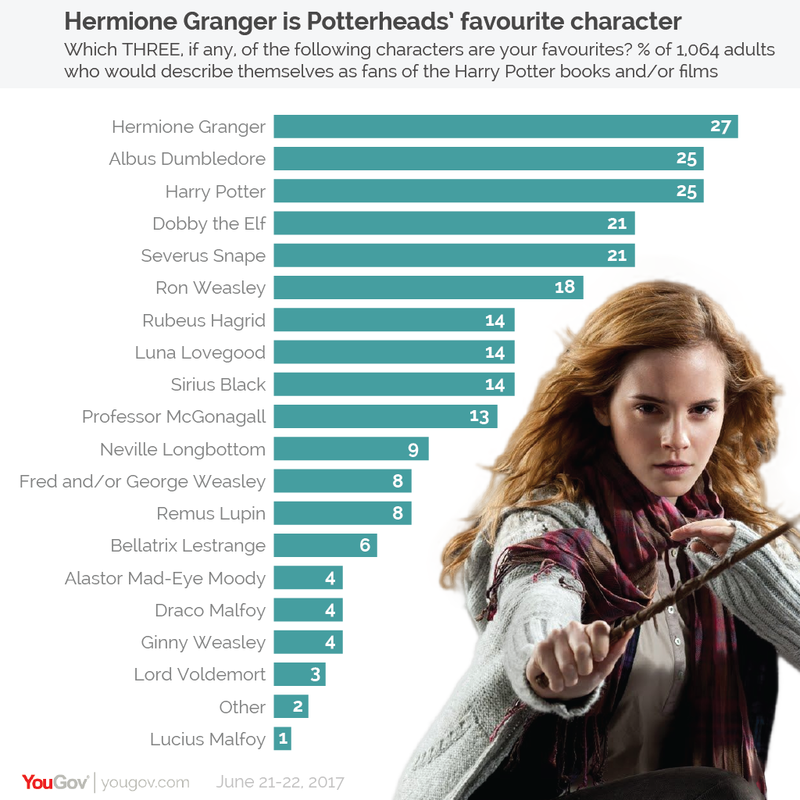 Miss Granger is particularly preferred by female Potterheads, at 31% compared to 23% among male fans. Hogwarts headmaster Albus Dumbledore was fans’ second most popular character, fractionally ahead of Harry on 25%. In joint fourth place on 21% were Dobby the House Elf and Severus Snape – the Potions Master was a particular favourite among those who self-identify as Slytherins, at 33%.